The year is 1901 and the recent fascination with tall buildings does not appear to be a passing fad. Real estate deals in Lower Manhattan suggest that more of these "skyscrapers" will soon be added to the New York City skyline. Technological advances are making it possible for new generations of skyscrapers to reach breathtaking heights. The builders of these steel giants are reaching higher and higher into the sky, hoping to satisfy their hunger for glory and prestige. Your uncle- God rest his soul- has left you a small property in Lower Manhattan. This is your chance to start your real estate career and to build, build, and build some more. 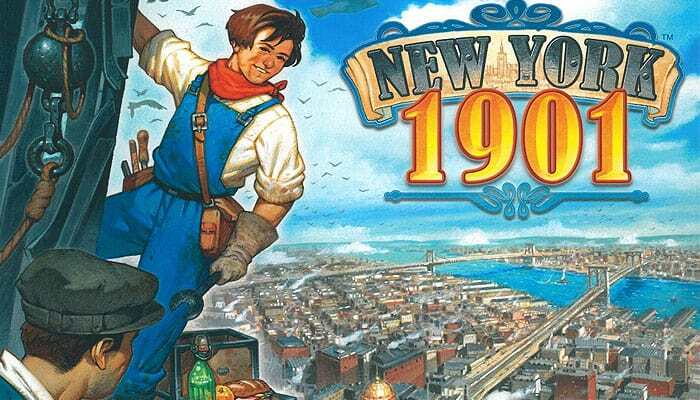 You'll be joining the ranks of the other great developers trying to establish the world's greatest metropolis: New York City! Relive the dawn of modern New York City, the historic years that made it what it is today. Build bigger and higher skyscrapers on some of Lower Manhattan's most iconic streets. Raise one of four legendary skyscrapers - the Park Row, the Singer, the Metropolitan Life, or the majestic Woolworth - and make one of them the crown jewel of your real estate empire! 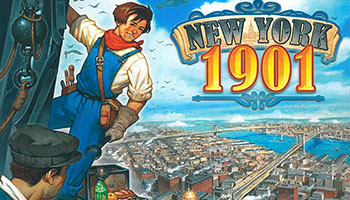 In New York 1901, the players are building skyscrapers on a map of New York's Financial District. Players take location cards from a card's display and then use 2-3 of those location cards to place Tetris-shaped building tiles on the board. They first build bronze level buildings. Later in the game those buildings can be replaced by silver level and gold level buildings. 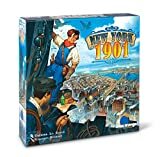 New York 1901 is a skyscraper building game based in New York City at the turn of the 20th century. Your objective is to develop the preeminent real estate empire in NYC by acquiring land and building skyscrapers to score points. On your turn, before you build, you will be given the option to either expand your estate by acquiring new territory or to demolish your standing buildings to replace them with better ones.